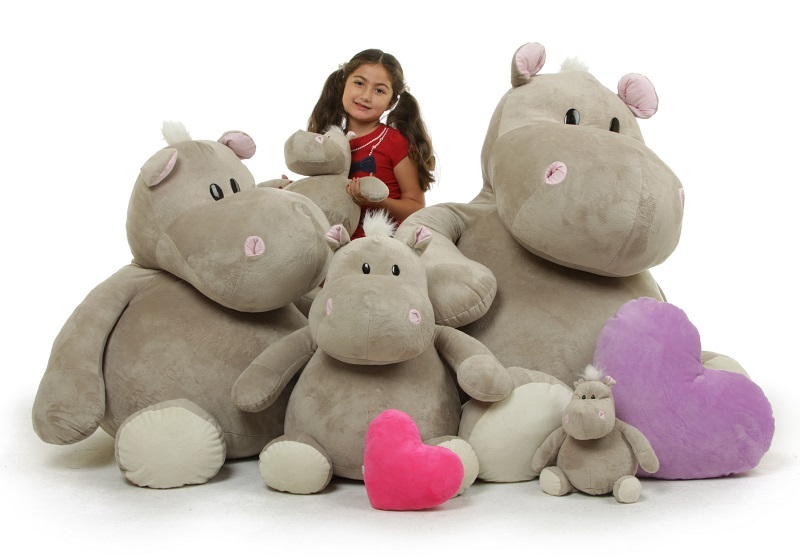 Bari Kubu 54 inch Father of the Kubu Stuffed Hippo Pod is A Giant Stuffed Hippopatamus! Big Bari is the brave father of the Kubu stuffed hippo pod, and the biggest stuffed hippo in the African savanna. Standing at 54 inches (4 1/2 feet) tall and sitting at 3 feet tall (36 inches), this giant plush hippo is sure to make anyone feel safe. Sure he's a big chubby hippopotamus, sure he spends his days soaking in the river and sleeping in the sun, sure most of the time he's a cuddly and friendly plush hippo, but if danger ever comes close, Bari can always be counted on to keep his pod safe. I didn't expect it to be so big! It was a wonderful surprise and well worth the price. If you love hippos and giant stuffed animals this is the one to get! My sone was so thrilled! He carries it everytwhere even though it is bigger than him. Well made and super soft. Great lounging chair or cuddle toy.